Peruvanam Sree Mahadeva Temple, located near Cherupu in Thrissur is another famous temple noted for the annual Pooram festivals. 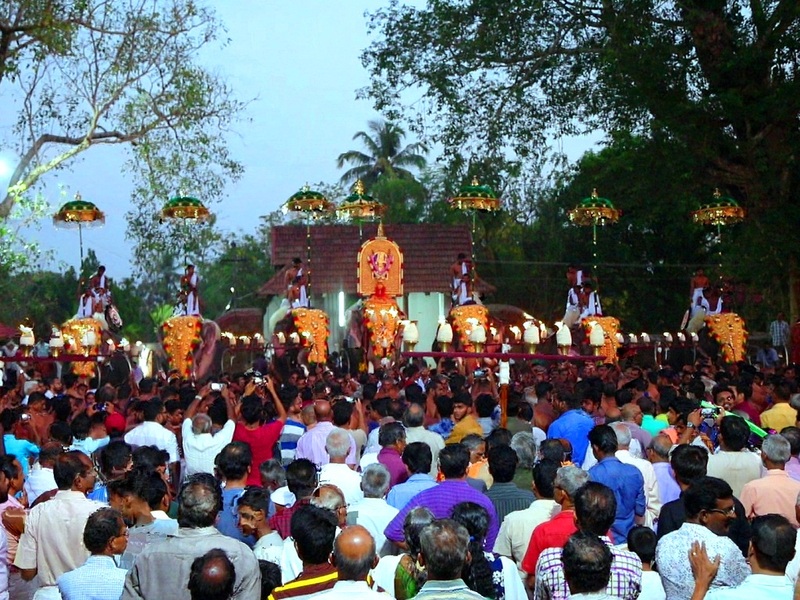 Peruvanam Pooram, celebrated in the Malayalam month of meenam (March-April), is believed that the new version of the festival has been in existence for 1437 years. During the festival, the procession carrying the deity atop a caparisoned elephant along with about six other jumbos accompanied by traditional percussion ensembles is a real treat for the eyes and ears. 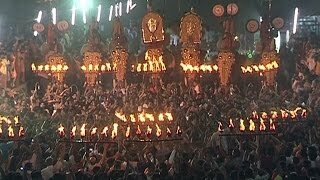 The Peruvanam Pooram begins with the arrival of Pishrikkal Bhagavathy. One of the highlights of Peruvanam Pooram is the performance of traditional orchestra by different participating deities. Pandi Melam is performed by Arattupuzha Sastha, Panchari Melam by Chathakudam Sastha, Thottippal Bhagavathy and Urakam Amma Thiruvadi and finally Panchavadayam and Pandi Melam by Cherpil Bhagavathy. The Pandi Melam of Cherpil Bhagavathy lasts for an hour and is done as a ritual of asking whether there are any other temples which want to perform a Pooram. All these God’s and Goddess, starting from Pisharikkal Bhagavathy, conclude the celebration with a ritual bath (arattu) at the temple pond, Thotukulam. 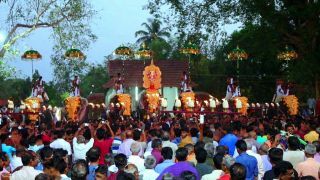 Each deity performs arattu immediately after the conclusion of one’s own Pooram. The historical reference about this temple dates back to the sixth century. Its architectural style touches the very soul of Kerala tradition and mastery. The temple has two sanctum sanatorium dedicated to Lord Shiva and is regionally known as irattayappan.